This coming weekend’s 38th Amalie Motor Oil NHRA Gatornationals at Gainesville, Florida marks some good, bad and ugly remembrances. 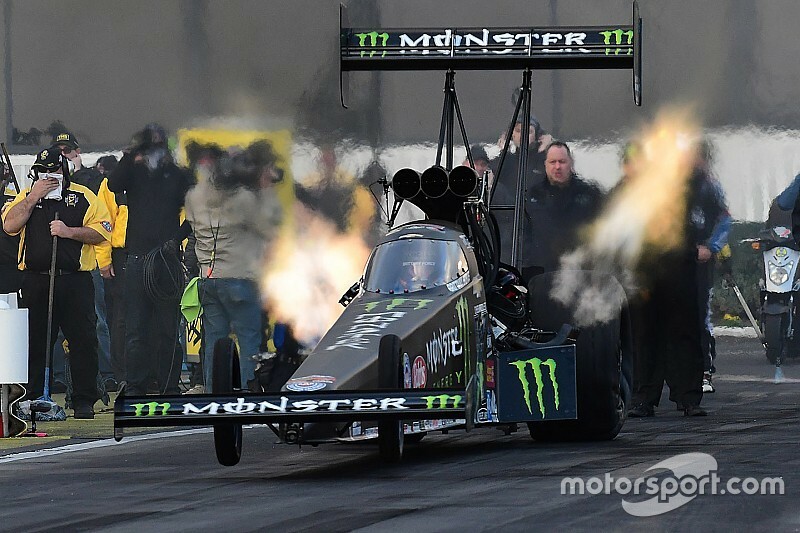 The good: After three years racing in NHRA’s Mello Yello Drag Racing Series Top Fuel category, Brittany Force won her first race in the Monster Energy dragster at Gainesville last year, one of three Wally trophies she’d bring home in 2016. One of John Force Racing’s “Next” drivers and the second of three daughters to John and Laurie Force, Brittany is the only Force racer to drive a rail - everyone else in the family races a Funny Car. Last year’s initial victory came one race after she lost to Leah Pritchett in Phoenix, as she did again last month. Brittany Force would love history to continue repeating. The bad: In 2007, the Gatornationals were tragic for the Medlen family and the Force team. Eric Medlen, whose beloved father was his crew chief at JFR, was also regarded by team owner John Force as the son he never had, and already had six wins to his credit. 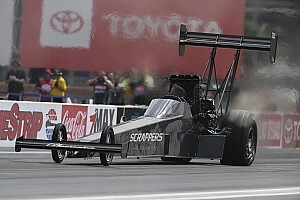 After bowing out in the first round of Funny Car eliminations that weekend, the crew elected to stay on Monday and test. After watching a bunch of drivers take their rails and floppers down the Gainesville quarter-mile in the right lane, Medlen was the first to attempt a pass on the left. But frighteningly severe tire shake led Medlen’s helmet to make sharp contact with the roll bars and the head injuries he suffered led to his death. As proof that good can come from bad, John Medlen’s hard work thereafter spurred a renaissance in Funny Car chassis safety – and NHRA safety as a whole - allowing countless drivers to walk away from crashes since that time. The ugly: There’s plenty of video and still photography that recounts the trauma sustained at Gainesville in 2015, when three-time Top Fuel champion and four-time Gatornationals winner Larry Dixon took off, and the landing fractured vertebrae T4-T5. It wasn’t the best recuperation for a guy who’d just beaten throat cancer. Yet Dixon still managed to finish fourth in the final points standings that year, only to be jettisoned from his ride after the 2015 season. Dixon has now started down the road to emulating one of his early employers, Don “Snake” Prudhomme, by starting his own team Larry Dixon Racing, and thus aims for his fifth Gatornationals Wally trophy in his own car. 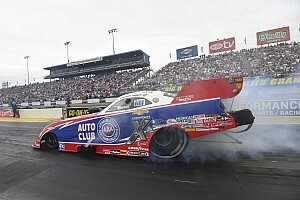 Gainesville is the third of the 24-race NHRA season but the first for Pro Stock Motorcycle. As is customary, many in the PSM field stopped en route to test at Valdosta, Georgia in anticipation of their first race of the year. Led by reigning champ and Suzuki rider Jerry Savoie, the 24-bike field at the Amalie Motor Oil Gatornationals is quite strong. Although only Vance & Hines’ Andrew Hines and Eddie Krawiec are able to race the Harley-Davidson V-Rod, the entry list is peppered with plenty of Suzuki, Buell and Victory motorcycles. Many riders have changed teams over the off-season and some have changed their manufacturer affiliation. Two-time champ Matt Smith, who won for the first time in a couple of years last November in the Pomona season finale aboard his Victory motorcycle, has the two-bike team of Chad Reed and Angelle Sampey joining the assault with Victory. Strangely, Smith’s wife Angie is riding a Buell this year, joining Chip Ellis, Hector Arana and son Hector Jr., Melissa Surber and her dad James, Shawn Gann, Mike Berry, David Hope, John Hall and Scott Bottorff competing with the Buell brand. The Suzuki contingent includes Savoie and new teammate, 2010 champ LE Tonglet, who will be riding a clone of the champ’s motorcycle. They are joined by Kissimmee, Fla. rider Andrea Rawlings, Scott Pollacheck (switching from Buell), veteran Steve Johnson, Karen Stoffer, Joey Gladstone and Brian Pretzel. More riders could be added to this group as the season progresses, but it’s customarily a waxing and waning entry list that starts strong at this venue. In Top Fuel, at least 15 drivers will aim to halt Leah Pritchett’s charge after she claimed the first two races of the year. Top of the list goes to defending Gatornationals winner Brittany Force, as mentioned above, but the balance of Pritchett’s Don Schumacher Racing teammates are taking aim as well, including three-time and reigning dragster champ Antron Brown, who currently stands fourth in the standings. Eight-time titleholder Tony Schumacher, second behind Pritchett is hoping to add to his four successes at this central Florida track. We can’t neglect Doug Kalitta, Steve Torrence, Shawn Reed, rookie Troy Coughlin Jr, tied with Scott Palmer for eighth place and Terry McMillen and Clay Millican, who each hold 10th place points. Larry Dixon, as already noted makes his return, while mong those aiming for the top half of the ladder is the ageless Chris Karamesines, who starts his season in Gainesville. In the Funny Car ranks, everybody is chasing two-time champ Matt Hagan, whose Don Schumacher Racing Dodge Charger R/T has conquered both races thus far. He’ll have to contend with teammate and reigning champ Ron Capps, John Force Racing’s Courtney Force in her Chevrolet Camaro SS, squadmate Tommy Johnson Jr. and 16-time champ John Force’s Camaro, as he aims for his eighth Wally trophy at this track. This field includes former Top Fuel racer JR Todd in Kalitta Motorsports’ Toyota Camry, Jim Campbell driving Jim Dunn’s Camry, the eighth-place tied drivers Jack Beckman from DSR and Tim Wilkerson in a Ford Shelby Mustang, along with defending Gatornationals champ Robert Hight in his Camaro SS. Part-timer Bob Tasca III will race a 2017 Mustang, Dave Richards will campaign a ’14 Mustang, two-time champ Cruz Pedregon will race a Camry, as will 2015 flopper champion Del Worsham and Alexis DeJoria. So it’s a full field of 16 racers for the Gators, but other entries may appear. Pro Stock looks much like it did last year - the Summit Racing/KB Racing duo of Greg Anderson and Jason Line are romping in their Chevrolet Camaros, having claimed a win apiece. Between them, Anderson and Line dominated the first half of the 2016 season. Could another Camaro driver or, perhaps, a Dodge Dart entry, prevent a similar sequence this year. With Elite Motorsport returning to the Chevrolet camp, Jeg Coughlin Jr. holds third-place points, followed by the third Summit entry for Bo Butner. Rookie Tanner Gray, making an excellent start as he strives for Auto Club Road to the Future first-year honors holds fifth place points. former top rookies Drew Skillman and Vincent Nobile are behind Gray in points, followed by Tanner’s father Shane Gray, who intends to race a partial season this year. Two-time champ Erica Enders and Chris McGaha round out the current top 10, all of these entries in the Chevrolet Camaro camp. Those standings leave the Dodge contingent out of the top rankings, including former champ Allen Johnson, having a tough start to his campaign after finishing eighth with a single win - at Bandimere Speedway - in 2016. There’s a second Dart on the premises, for Alan Prusiensky, with the balance of this field of 16 racing the Camaro at Gainesville. In addition to this five professional categories, NHRA has eight Lucas Oil sportsmen classes racing at the Gatornationals, which means the action will be non-stop from morning to night. The weather forecast currently shows Saturday as the warmest day of this three-day meet, with highs in the upper 70s and zero chance of precipitation, which could make this weekend’s racing at Gainesville Raceway among the quickest and fastest this excellent track has seen. As the site where Kenny Bernstein first mauled the 300-mph mark in 1992, Gainesville and the Gatornationals are a revered spectacle in the NHRA drag racing world. Will more records fall this week?